Board Certified Specialist, eighteen years of trial experience, handled thousands of criminal cases, and gained specialized knowledge as a Former Assistant District Attorney. Committed to providing excellent legal services in criminal and civil defense representation of our clients. Raleigh Criminal Defense Attorney Edd K. Roberts has a passion for defending the accused and working tirelessly to achieve the best possible outcome. Since the inception of Roberts Law Office in 2003, Edd K. Roberts has been a full service criminal defense attorney and DWI lawyer serving clients throughout the area. Our focus has always been on providing the best legal advice and services in criminal defense and DWI/ DUI; our clients have come to rely on our results. If you have been recently charged with a crime, we understand this is a difficult time and possibly an unexpected situation you may find yourself in and we are here to help. As your Raleigh criminal defense attorney and DWI lawyer, Edd K. Roberts at Roberts Law Office will stand up for your legal rights and fight aggressively for the best possible outcome in your case. Our business philosophy is simple, “Treat clients the way we would want to be treated under those circumstances and work hard to achieve the best possible result.” Being a specialized criminal defense law office allows us to use all of our gained knowledge, experience and individual talents to help folks in difficult situations. We look forward to your call. Martindale-Hubbell assigns after thorough and objective client reviews/ratings a national service rating to attorneys. Clients are asked in their reviews to rate attorneys based on the quality of service received, overall value of the service they received for the money they paid, responsiveness and communication they got from their attorney while working with them to resolve their matter and whether they would recommend the attorney to others. Attorneys are scored on a scale of 0.0 to 5.0. An overall median score from all the testimonials from clients for a given year that falls within the 4.0 to 5.0 range places the attorney in the highest category of client satisfaction. 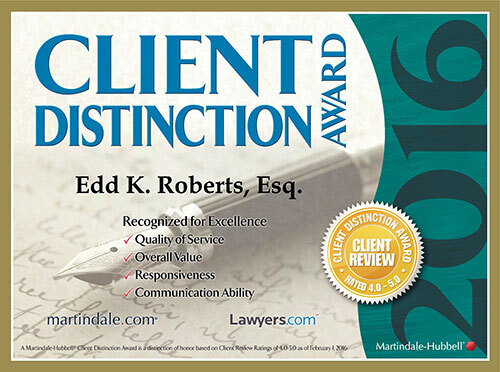 Our Raleigh criminal law office has received this Client Distinction Award from Martindale-Hubbell®. We assess each case individually and work hard for our clients to achieve the best results. Prior results for former clients do not guarantee any particular outcome for your case.